Overlooking Sydney’s famed Hyde park, “The Hyde” is now one of Sydney’s most prestigious addresses. The Hyde offers stunning views of Hyde Park itself, as well as views over Sydney Harbour and many of central Sydney’s other landmarks. 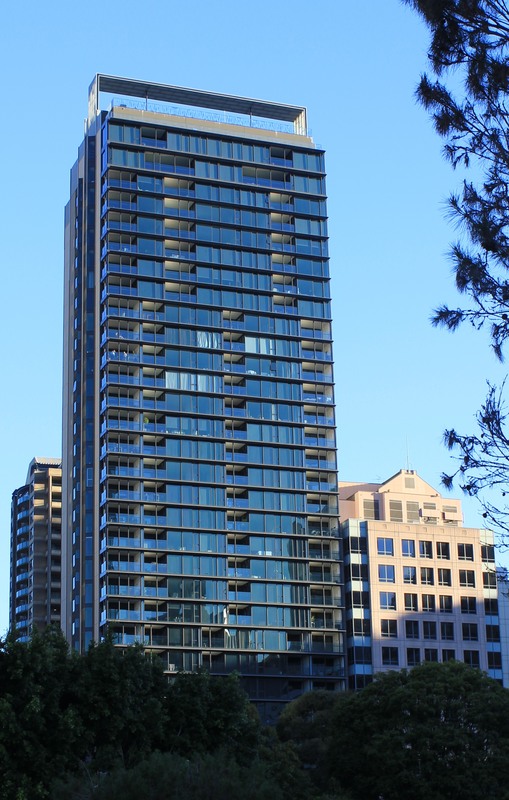 The site was formerly home to a medium rise office building constructed in the 1970s, which was demolished to make way for the new residential tower, which is 34 stories tall and contains 131 apartments. The Hyde is also home to one of Sydney’s most expensive penthouses, which is formed by the uppermost two floors of the building. The Hyde was designed by award winning architects WOHA, and constructed by Grocon for developer Stockland. WOHA’s approach was to emphasise the site’s advantages, so the north facing façade has been developed as a transparent curtain wall that gives a spectacular backdrop to everyday life. The most visible contribution G.James made to the Hyde is the curtain wall on the north face of the building. The curtain wall uses a mixture of centre pocket & front pocket glazing to add a visual texture to the façade. The north facing façade is exposed to direct sunlight, so a number of climate control measures were used to mitigate the effect of the sun’s heat. A custom sunshade solution was designed to help shield the building from the sun. Enclosed indoor/outdoor balcony areas were also incorporated into the building, these are able to be opened for ventilation in fair weather. The front of the building also contains planter boxes, which are planted with climbing vines. The curtain wall on the lower floors integrates a supporting grate structure which protects these boxes, and encourages the vines to grow up the building. The rear façade features a striking pattern of contrasting shades of grey concrete. Punched windows supplied by G.James are a subtle addition to this face of the building. On the ground floor, the shopfront uses channel glazed floor to ceiling glass. An internal water feature created the added challenge of interfacing its supporting structure with the shopfront glazing. G.James’ 445 series sliding doors were used in the apartments, the use of which required an interface between the internal framing for the sliding doors and the curtain wall. This arrangement presented an interesting technical challenge, as the interface had to allow the curtain wall to move independantly of the internal structure (to accomodate factors such as thermal expansion and wind loading), whilst still remaining weather tight and allowing for water drainage. 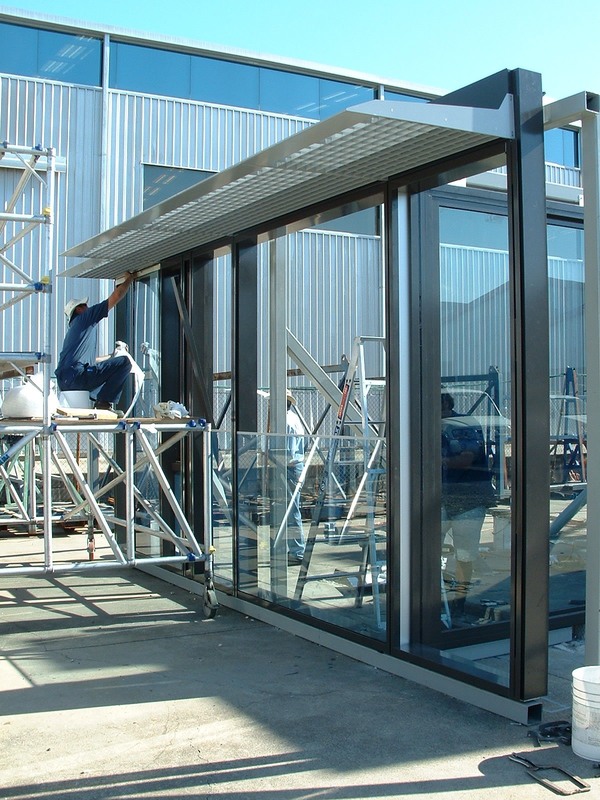 The Hyde glazing was designed and manufactured from the Brisbane commercial divisions and delivered and fitted in situ by our Sydney branch. Project management was performed at both ends to assist in the smooth running of the job. A section of the building was recreated on the G.James prototype testing facility, where a full range of pressure and water tests were completed successfully with a wide range of people involved with its development and testing review, including builders, consultants and engineers. Although the Hyde provided more than its share of design difficulties, each was overcome in a timely manner to the success of the final product. Extensive testing was carried out on site to ensure high quality attainment of the design resolutions. G.James has nearly 40 years experience in construction of large commercial facades and has continually demonstrated its expertise by meeting the the requirements of the ever challenging design aspirations of clients and architects. This entry was posted in Doors, Facades, Windows and tagged Curtain Walls, Louvres and Sunblades, Punched Windows, Sliding Door, Sydney. Bookmark the permalink.